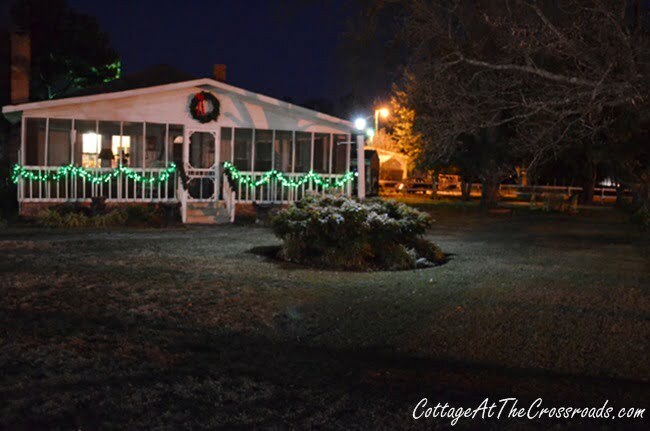 Leo and I have been really busy for the past few days working on our outdoor Christmas decor. When we start decorating for the holidays, we always start on the outside first. 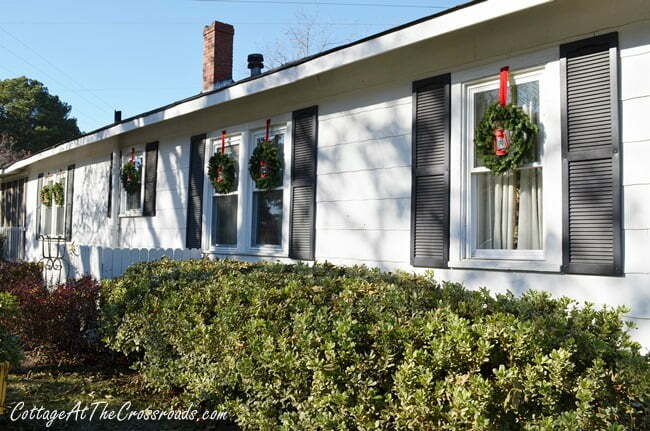 This year, we had to replace all our outdoor wreaths that we hang in the windows. The ones we used for the past 5 years had faded so we made a trip to Carolina Pottery in Columbia during October in order to purchase 20 new wreaths. 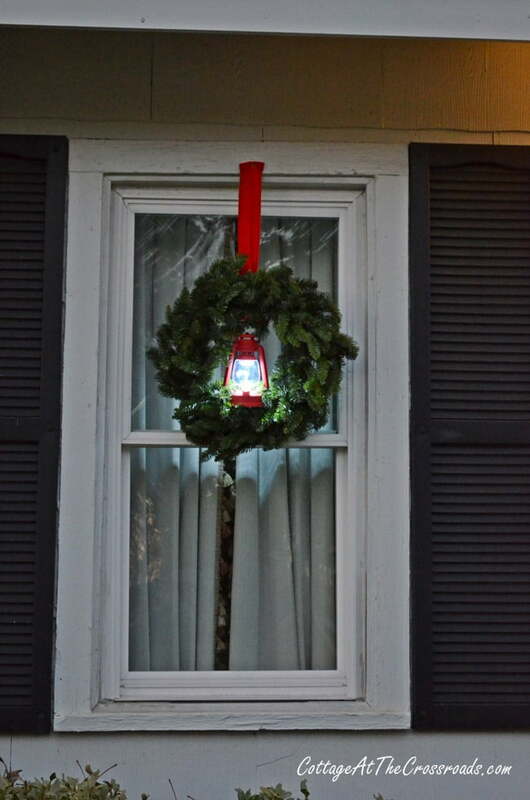 We wanted to put something just a little different on the wreaths this year but couldn’t decide exactly what until Leo spotted some small red bivouac lanterns in a discount store. And we came home with 20 little red lanterns that day. 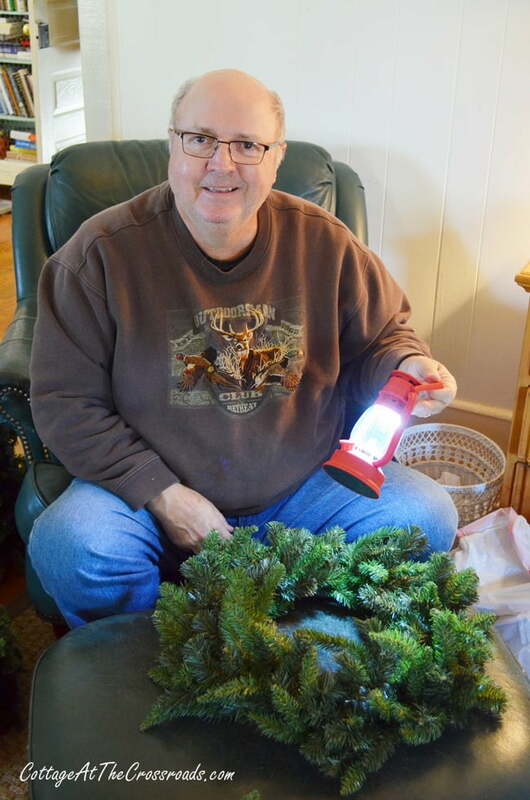 A few days ago during our cold spell, Leo fluffed all the new wreaths and wired the lanterns into them. Lucy was by his side, as always, and was eyeing the lanterns. Glad she didn’t think they were toys! Unfortunately, he discovered several black and blue lanterns in some of the boxes and had to return them to the discount store. Luckily, they had more of the red ones. 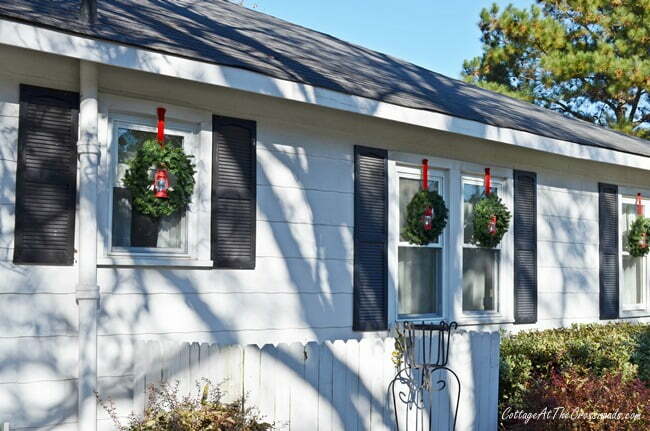 And the new wreaths hung out on our sofa for a few days until it warmed up enough for us to hang them outside. 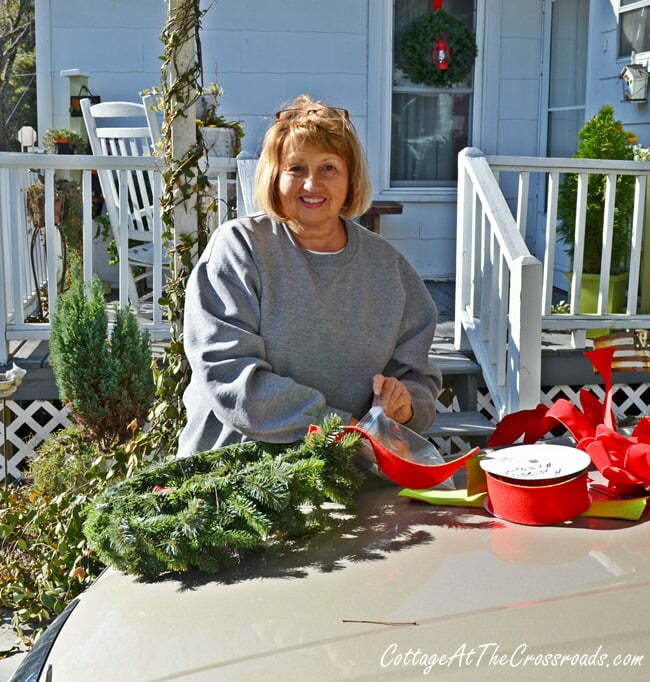 Yesterday was a bit warmer so I worked outside to attach ribbon to the wreaths. Of course, we had to stop when we realized that the red velvet ribbon that we had already purchased started splitting from the weight of the wreath. So we ran to Taylor Garden Center in Florence to get some sturdier ribbon. Leo and I worked as a team. I attached the ribbon to the wreaths and he climbed up on a ladder to hang them from the nails. This all sounds easy but Leo had to do a little trimming of the shrubbery just to get the ladder between it and the house. And making sure they are all hanging at the same height takes a bit of time as well. But we finally got them all hanging on the house, my mom’s apartment, and the storage buildings. A very traditional look for our country cottage. We couldn’t wait until dusk to see how the lanterns would look. They are battery operated, and we have no idea how long the batteries will keep them lit so we may have to go around the house replacing batteries at some point during the holidays. But that’s ok because this is how they look at night. I just love the little red lanterns! Here’s how they look on Leo’s shop. 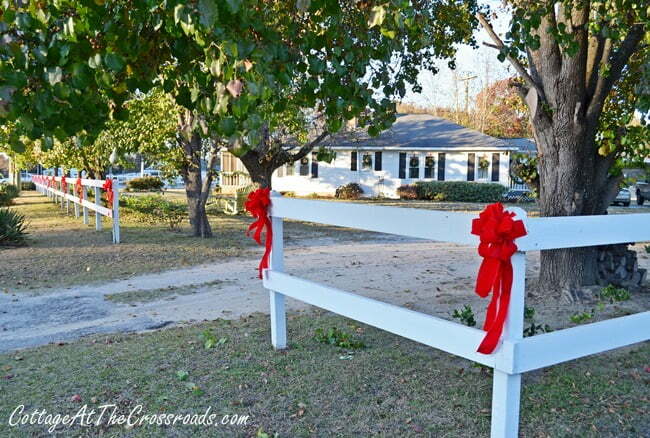 Today we attached new red bows to the white fence surrounding our house. 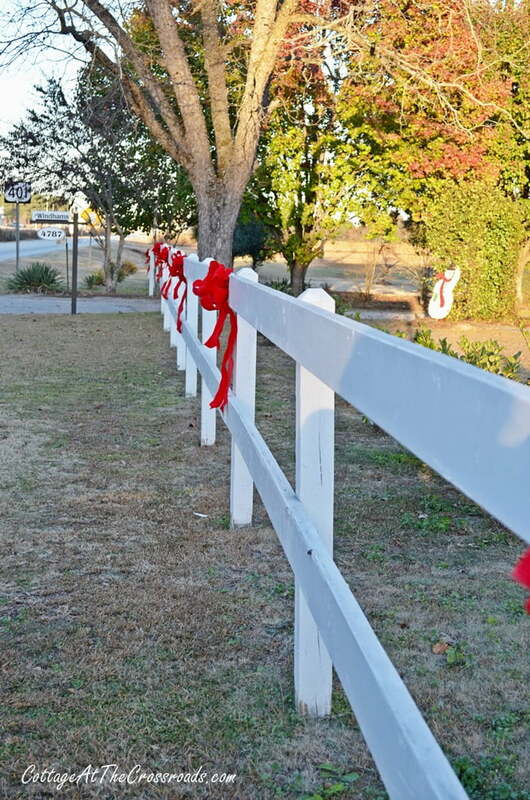 We started adding red bows on our fence five years ago when we first moved here, and we continued to use the same ones each year. But this year they needed replacing, as well. Five years seems to be the magic number for outdoor decorations. 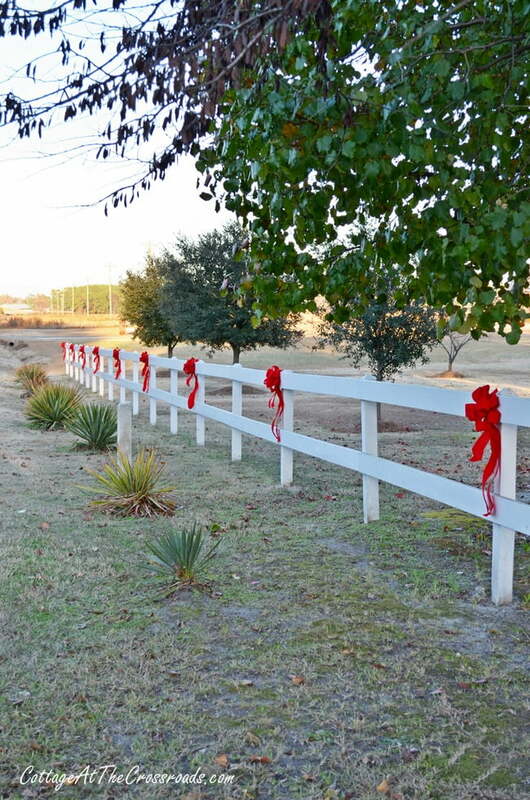 The bows continue all along the fence in front of the house as well as the side. And they continue down this section of fence that’s in front of our garden. That’s a lot of bows, people! Luckily, I was able to find some really nice, pre-made ones at a good price at Carolina Pottery in Columbia, SC. Bows and garland-a very traditional look here at the Crossroads! Loving the bows on the fence. We have a 300metre long farm driveway which had very not pretty strand fencing. I was thinking of bowing each post next Christmas if I get enough bows in the January sales. How would I gauge what size bow is needed? Simply lovely! I think my neighbors will be seeing at least one of them at my house very soon! 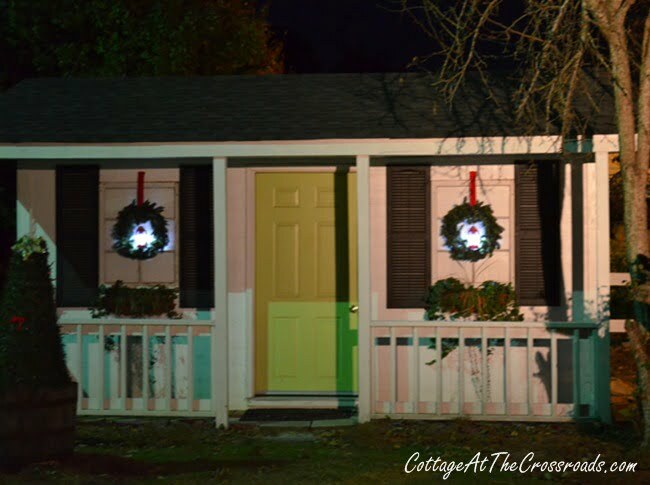 Oh my goodness….Just beautiful….. the cottage is absolutely “perfectly decorated”!!!! Those lanterns are the perfect touch as well!! Thank you for sharing… I love the way it looks at night too….. Happy Thanksgiving and Merry & blessed Christmas!!!! Everything looks very pretty. We lived in Columbia in 1998 and 1999 for my husbands job. Actually, we lived in Irmo and he worked in Columbia. We loved living there. A beautiful city. Pat, we lived in Columbia for many years, but we were in Mt. Pleasant during the years you were there! Nice to meet ya! Your home looks lovely! 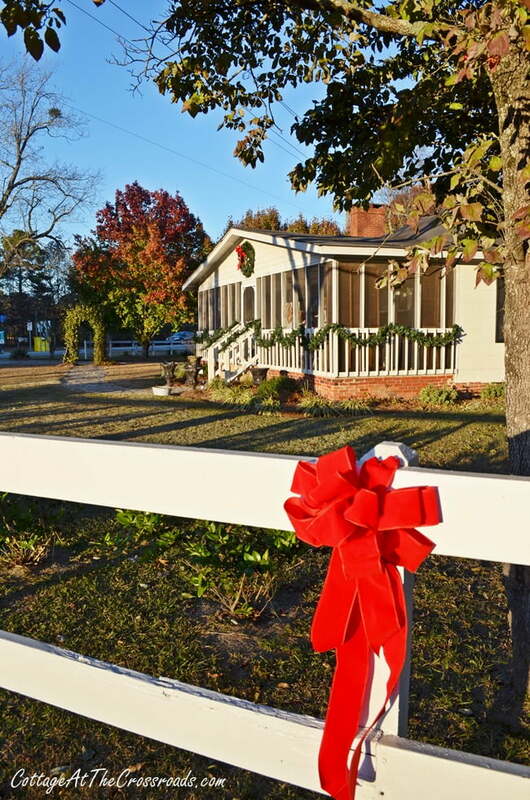 We have a similar white ranch and I would so love a fence like that around our property…maybe I will put that on my Christmas list!! Thanks for the inspiration! 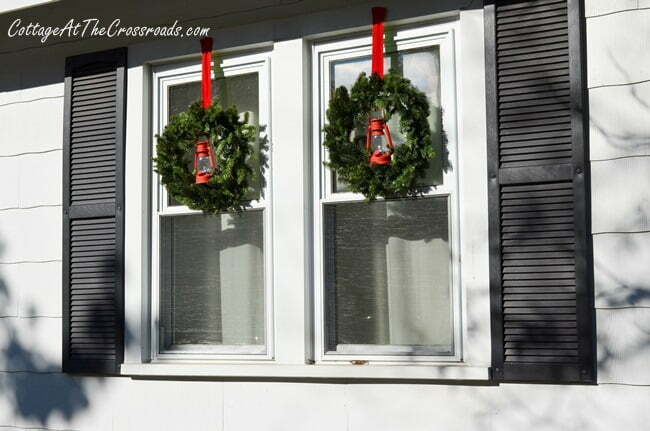 What a cute idea to add the lanterns to the wreaths. I hope you will let us know how long the batteries last. I considered adding battery powered lights to some garland that I put up that doesn’t have access to electricity but was afraid to because of the unknown of how long the batteries will last. I love the outside decor you did. 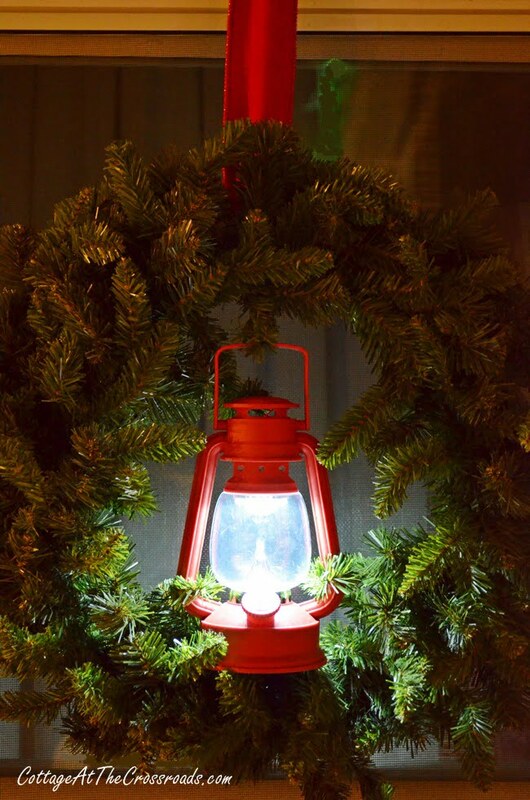 Those wreaths are a wonderful idea with the lanterns…. Those little red lanterns are so cute,great idea.Love your decorations. It all looks so pretty and festive. I’m waiting until next weekend to start my decorating. I’ll have the family for Thanksgiving, and will start after they are all gone. Jane and Leo, Love the red lanterns! They look Great in your wreaths. 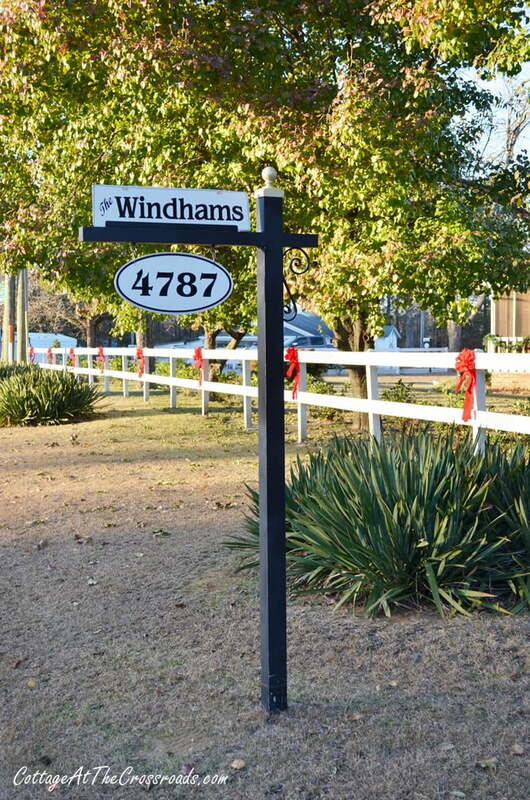 We used to live there in Sumter and are now in Texas. Wishing y’all a Happy Thanksgiving and a Very Merry Christmas! Jane those little red lanterns are such a fun idea. Everything is looking quite festive. Oh, gosh, I LOVE THE LANTERNS! So neat that they light up! I love the lanterns in the wreaths. How did you attach the ribbon to the wreaths? What size ribbon is it? All so lovely! It looks great! 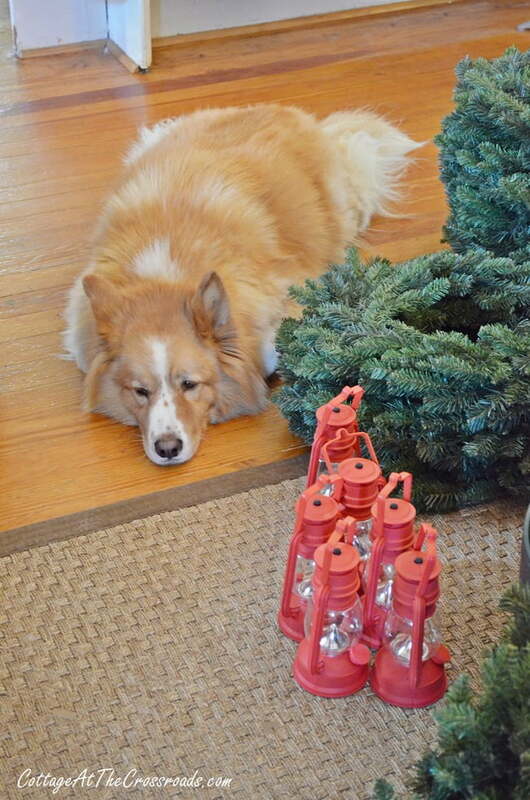 Today is the perfect day here to decorate, but no one does around here till after Tgiving. I will be out there alone freezing! 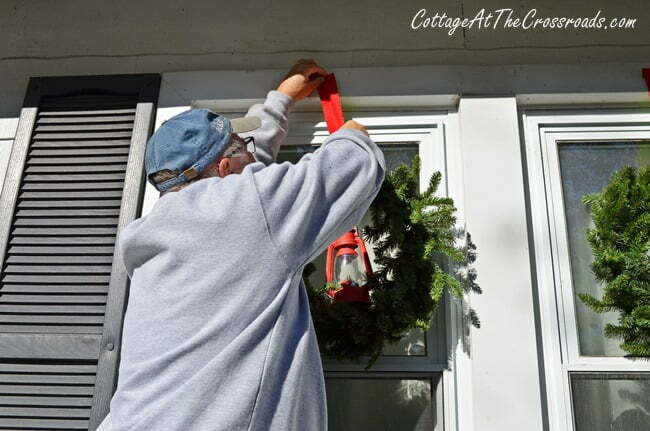 Like you, I too love the red lanterns & they make such an adorable addition to the wreaths! From where did you buy them?? We found the lanterns at Rochesters Imports in Sumter, SC. I think they have a few locations in South Carolina, but I don’t think you’ll find them nationally nor do they seem to have a website. Perhaps you could google red plastic bivouac (camping) lanterns with LED lights to see what you can find. Good luck with your search! Very cute Jane, the red lanterns inside the green wreaths look so great!! I’ll have to give full credit to Leo for finding them! Absolutely beautiful! I too very much love the lanterns. Which store did you find them at? Michelle, we found them at Rochesters Imports, a local store in Sumter, SC. What a beautiful Christmas display. Thank you for sharing this with us. I especially like the red train lanterns.,, without having to worry about anything catching on fire. What a clever idea. Thanks Kayteelou, I think all we have to worry about is the batteries lasting! Wow! This is so pretty! I hope I can find the lanterns so I can do this! What discount store did you find them in? It looks lovely. I would love to know where you purchased the lanterns! 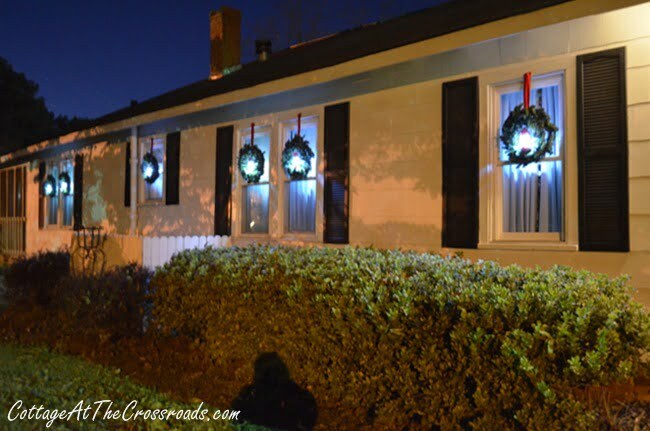 Charla, we purchased the lanterns from a local store in Sumter, SC. Just beautiful!! 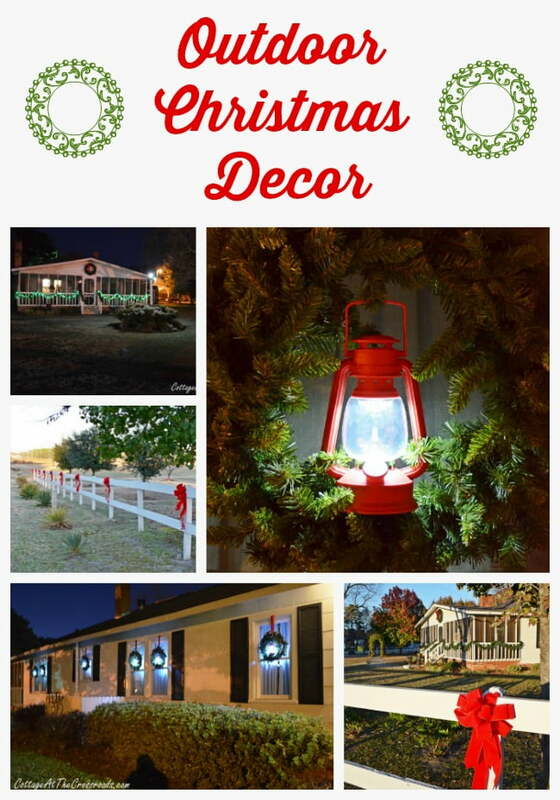 !….I can just imagine people stopping to take a look at your beautifully decorated home!…Love the lanterns….which discount store did you find them? wow, that was a lot of work but it sure does look pretty. My preference is always classic and traditional red and green. i love the lanterns. will you keep them lit the whole time or shut them off each day. 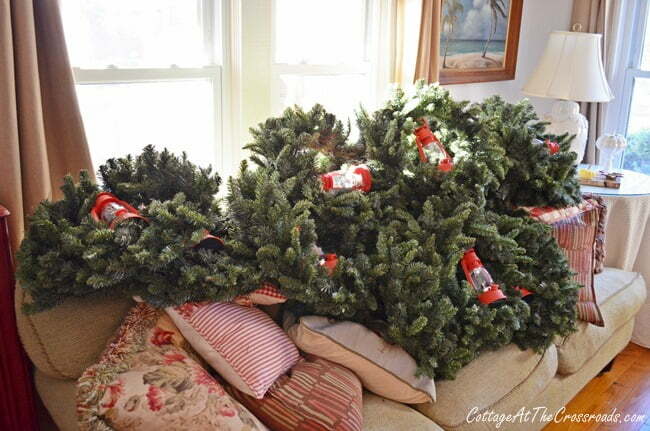 Laura, our plan is to just leave them on day and night since we would need a ladder to reach some of the wreaths. Today they’re giving off a nice glow on this dreary, rainy day! Which discount store. Love the idea. Live in Tennessee. Nancy, we bought them at a local store in Sumter, SC and I don’t think they have any locations except in our state. I looked for a website but I didn’t find one for Rochesters Imports. 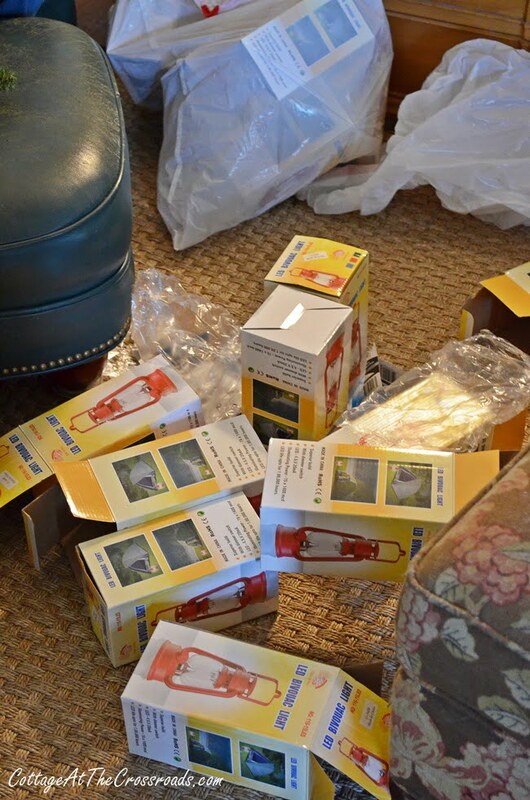 Hopefully, you can find some by googling LED camping lanterns. Hi you two! what a job; how beautiful; love those lantens; I can feel how it would be to drive up the drive way at night w/those shining. God bless you and have a beautiful Thanksgiving and a fabulous Christmas. Awww, thank you Phyllis! Happy Thanksgiving to you, too! 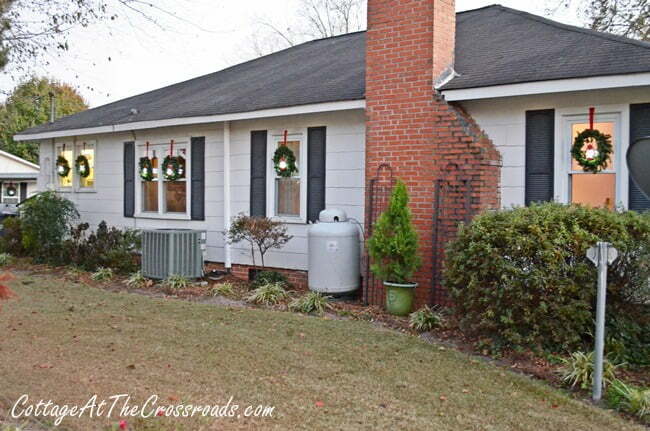 You and Leo have done a beautiful job on the outdoor décor…LOVE those cute lanterns (awesome idea). HAPPY THANKSGIVING!! Right back at ‘cha, Linda! Blessings to you and your family! Everything looks so pretty. Love you wreaths with the lanterns.